El Camino Real de Tierra Adentro— the Royal Road of the Interior Lands— is one of the longest, oldest, and most historic trails in the Americas. It was built along Native American footpaths, became a primary transportation corridor for the Spanish colonies, linked the American territory with the new nation of Mexico, and continues to be a thriving international highway of commerce, culture, and people. 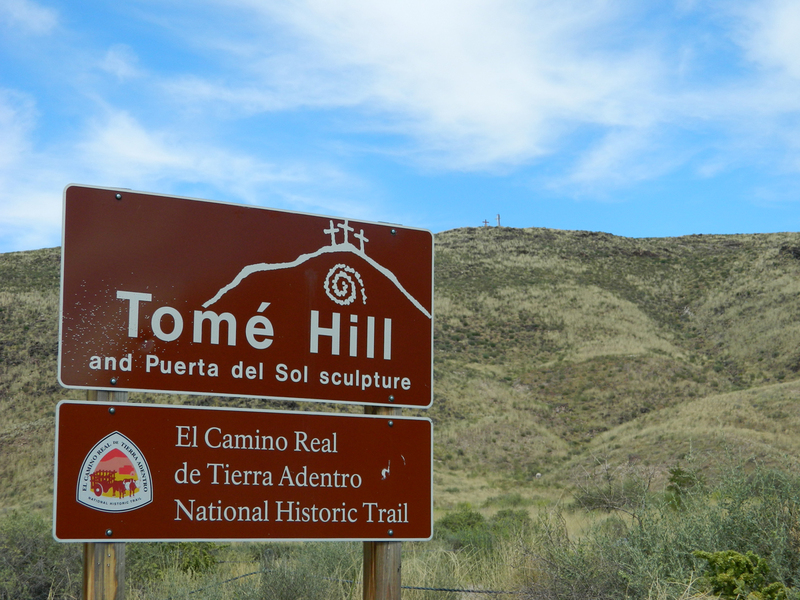 El Camino Real de Tierra Adentro National Historic Trail runs more than 400 miles through New Mexico and Texas. From the border at Ciudad Juarez it extends another 1100 miles through Mexico. During the Spanish colonial period it connected Mexico City with the northern frontier capital of Santa Fe and the many mining communities, haciendas, fortresses, and pueblos of New Spain. Native Americans, Spanish conquistadors, soldiers, missionaries, merchants, and settlers have traveled its great length. Human settlement along the upper Rio Grande in central New Mexico began circa 1300 ad. . During the protohistoric period in the Southwest, the original inhabitants along the Rio Grande established pueblos and extensive trade routes to neighboring peoples in the east, south, and west. 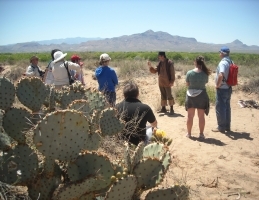 For approximately two centuries, Native American trade connected the pueblos on and near the Rio Grande, and consequently, many trails were traveled and marked. In the mid-Sixteenth Century, strangers from the south appeared in the pueblo country along the Rio Grande when Spaniards and Mexican Indians led by Francisco Vázquez de Coronado explored present-day New Mexico and lands to the east in the Great Plains. The Coronado exploration of 1540-1542 anticipated the first serious colonization efforts of New Spain’s far northern frontier well beyond the line of mining settlements by a half century. By 1580, Spanish settlements had been established as far north as the twenty-seventh parallel, approximately 850 miles north of Mexico City. The richest mining centers were connected by a well-traveled road, which would ultimately be extended to beyond Santa Fe, New Mexico, and this route later became known as the Royal Road to the Interior Lands—El Camino Real de Tierra Adentro. In the late Sixteenth Century, the road linked Mexico City with the towns of San Juan del Río, Querétaro, Celaya, Silao, León, San Juan de los Lagos, Aguas Calientes, Zacatecas, Fresnillo, Sombrerete, Nombre de Dios, Durango, and Santa Bárbara in the region known as the Valle de San Bartolomé. During the final two decades of the Sixteenth Century, renewed interest emerged in the tierra incognito Coronado and his men explored decades earlier. Several expeditions disembarked from the Province of Nueva Vizcaya and followed the Río Conchos downstream to its confluence with Río del Norte, one of the many names Spaniards applied to the Rio Grande, and then traced upstream and entered present-day New Mexico thusly; or from that confluence the wayfarers continued downstream to the confluence of Río del Norte and the Pecos River, which they retraced upstream into New Mexico. None of these expeditions succeeded, yet when Don Juan de Oñate organized an entrada that departed Santa Bárbara in the second fortnight of December 1597 after considerable delay from Spanish officialdom, serious effort to colonize the far northern frontier of Nueva España commenced in earnest. Oñate’s northward journey retraced routes previously traveled by his countrymen, but upon arriving at the Río Conchos Oñate determined upon a due-north course rather than follow the river downstream. The selected route traversed arid, inhospitable desert terrain, and when the Spaniards reached the bank of the Río del Norte in April 1598 they had established an important new segment of the route ultimately to become the El Camino Real de Tierra Adentro. Over the next three months until early July 1598, Oñate and his followers continued their arduous journey through an unknown land of great beauty, little water, and numerous pueblos. 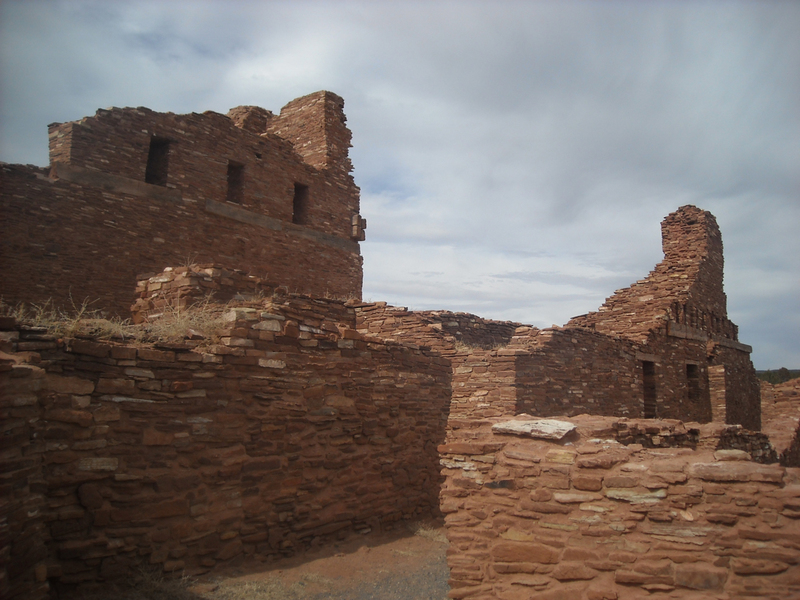 Their arrival in the pueblos north of present-day Santa Fe marked the end of the long journey and the beginning of Spain’s indelible imprint on New Mexico. In the opening decades of the Seventeenth Century, commerce and trade between the isolated settlements in Nuevo Méjico and those north of Mexico City gradually evolved. Caravans were organized annually to convey a wide array of items to the missions, presidios, haciendas, and villas on the frontier otherwise unavailable. In turn, locally-produced items from the frontier were conveyed southward to the eager buyers; piñon nuts, buffalo hides, santos, wool blankets, and other goods were highly valued far south of the Rio Grande. As the century unfolded, a well-organized commercial system linked the settlements along the 1,600 miles between Mexico City and Santa Fe. However, in the late 1670s, drought conditions settled over the frontier, and, combined with the decades’ toll of Spanish oppression over Native Americans, the general discontent and crop failures resulted in a violent and successful uprising against the Iberians in August 1680. 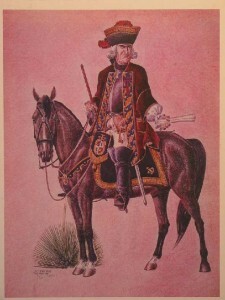 The coordinated assault resulted in the expulsion of Spaniards from New Mexico, who fled south along the El Camino Real de Tierra Adentro to El Paso del Norte, until the Reconquista in 1692 under Don Diego de Vargas. The resumption of Spanish authority in New Mexico in the final decade of the Seventeenth Century marked the beginning of a vigorous burst of acculturation and settlement in the far-flung corners of Spain’s New World empire. Throughout the new century, settlers continued to arrive in New Mexico and travel along the Camino Real in both directions accelerated. Tense relations continued between Native Americans and Spaniards, however; nonetheless, as the century unfolded caravans traveled north from Mexico, and many new parajes were established by caravan leaders along the Camino Real in New Mexico. These campgrounds marked the stopping points of a day’s travel, were frequently used each year, and became significant components along the route. With regard to the trail, one must think of the route in general terms. Unlike the modern highway systems in Mexico and the United States, the Camino Real differed in that it is not a unified, single entity. Rather, caravans along the route responded to local conditions to avoid washed-out arroyos, overgrazed ranges, deep sands, steep slopes, and generally difficult terrain. Thus, the Camino Real featured many stretches of well-traveled segments and braids that departed from the main route and merged with the trail after circumventing the unfavorable terrain. Similarly, very few portions of the Camino Real were paved, and those stretches existed only in the larger settlements; certainly, the trail wound its way across great expanses of open country with natural features as landmarks to mark the route across the Chihuahuan Desert. In the Eighteenth Century, Spain exerted its influence and hold over its North American empire, and the few but crucial roads emanating from Mexico to Texas, New Mexico, and California provided the routes to supply mission churches, villas, and presidios. 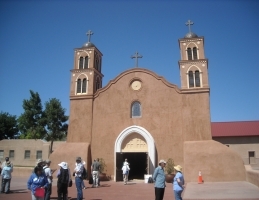 In this manner, sites such as the presidio of San Elzeario and the hacienda of Tiburcios, both near present-day San Elizario, Texas, the mission churches in Socorro del Sur and Ysleta del Sur, and the settlement of El Paso del Norte; and further north Mesilla, Doña Ana, Socorro, Albuquerque, Bernalillo, and Santa Fe and other sites along the trail, were supplied by caravans. As the population increased along the Rio Grande, the need for goods and supplies from beyond the northern frontier similarly increased, which resulted in a well-organized trade system throughout the century. In the early decades of the Nineteenth Century, trade along the Camino Real was bolstered when merchants from Missouri began shipping goods from the United States into Mexico along the Santa Fe Trail. From the early 1820s through the mid-1840s, overland trade between the two nations was extensive, and the significance of this commercial enterprise was evident in the overall length of this international route that connected markets from Missouri to Mexico City. When Mexico won its independence from Spain in 1821, one year before American merchants and traders began in earnest to ship goods south, the former Royal Road to the Interior Lands was renamed the El Camino Nacional—the National Road—to reflect Mexico’s rejection of colonialism. This new era of the trail’s existence was short-lived, however; in 1846, when the United States and Mexico went to war against each other, the El Camino Nacional served as the invasion route for American troops entering New Mexico bound for El Paso and Ciudad Chihuahua. With the signing of the Treaty of Guadalupe Hidalgo in February 1848, Mexico lost an extensive amount of its northern frontier to the United States. Shortly thereafter, the Department of War authorized the establishment of military posts in the newly-designated Ninth Military District, which encompassed the Territory of New Mexico. During this era, the settlements near El Paso were aligned within New Mexico’s jurisdiction, and the length of the former Royal Road from the presidio of San Elizario north to the area around Santa Fe remained in active use to supply military outposts throughout the Territory. The twilight of the trail’s use occurred in the late 1870s and early 1880s, and with the advent of railroads into New Mexico at the beginning of the latter decade, travel along the trail gradually decreased. In the Twentieth Century, new roads were constructed in Northern Mexico, West Texas, and New Mexico to provide egress to travelers throughout the region. Travel along the former Spanish Colonial trail has never fully ended; with the advent of a modern highway system paved roads now parallel many sections of the former trail. 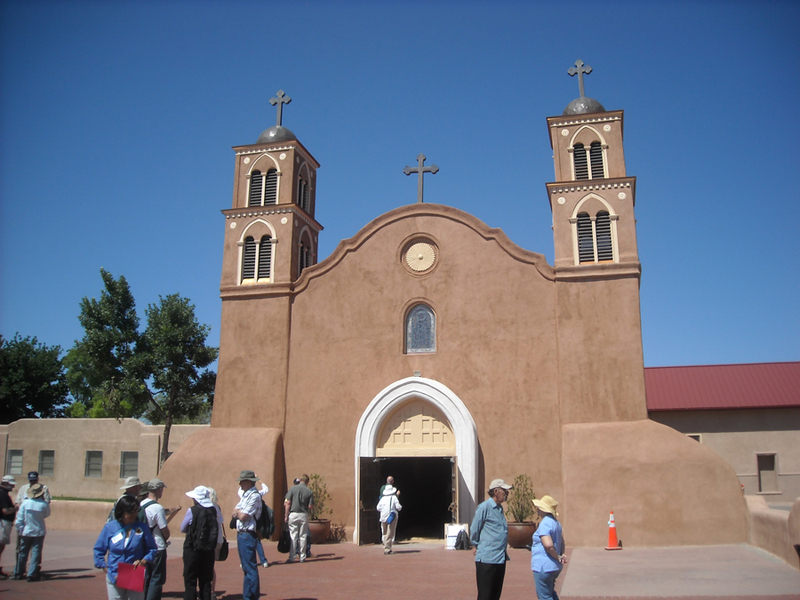 Contemporary travelers in New Mexico, for example, can leisurely drive along Interstate 25 from Santa Fe to Las Cruces and see much of the land once traversed by trade caravans. 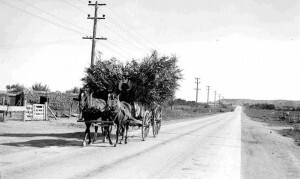 Portions of the route, such as New Mexico Highway 47 in Valencia and Bernalillo counties, form sections of the modern road system; thus, segments of the former Camino Real remain in daily use although asphalt now covers the route once traveled by people, animals, and carts in earlier centuries. Perhaps the most significant component of the Camino Real’s legacy pertains to the many families of Spanish descent who traveled the Royal Road north out of Mexico to permanently settle in the far northern frontier. Similarly, the Camino Real figures centrally in the region’s very rich multicultural history, and many voices have contributed their words to tell the story of the El Camino Real de Tierra Adentro. What is a camino real? A camino real is a road sanctioned by the Spanish Crown and maintained at Royal expense. As Spain extended its empire in North and South America beginning in the Fifteenth Century, a network of roads was established throughout this vast region in order to maintain control over the extensive colonial lands. How long is the El Camino Real de Tierra Adentro? The distance from Okhay Owingeh Pueblo north of Santa Fe to the southern terminus in Mexico City stretches more than 1,600 miles (approximately 2,600 kilometers), which makes this camino real one of the longest roads in North America. How did the route originate? Many portions of the trail had been used as footpaths by indigenous people for many years prior to the Oñate entrada and subsequent caravans blazing new segments. 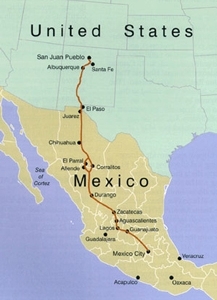 Over time, the Royal Road to the Interior Lands connected eight capital cities between Santa Fe and Mexico City as a public thoroughfare to link the metropolis to the far northern frontier. Are portions of the trail still visible? Yes, in many rural areas ruts and swales remain visible, such as at Yost Escarpment in Sierra County near Engle, New Mexico. However, much of the trail has been irrevocably impacted due to factors such as erosion, the spreading and regrowth of plant species along the route, and the construction of modern paved highways atop sections of the original trail in urban areas. What was the purpose of the El Camino Real de Tierra Adentro? In the Sixteenth Century mining settlements were gradually established north of Mexico City as precious metals, namely silver, were discovered. The principal route that connected these settlements was later extended much further to the north upon the colonization of New Mexico, and this route became known as the El Camino Real de Tierra Adentro. Thus, its purpose was to supply the mining frontier settlements as well as mission churches, haciendas, and villas along the entire route. 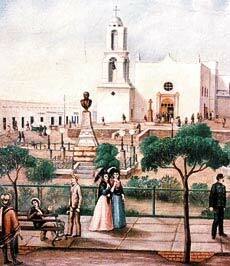 Is the El Camino Real de Tierra Adentro acknowledged for its significance? Yes, in both Mexico and the United States. 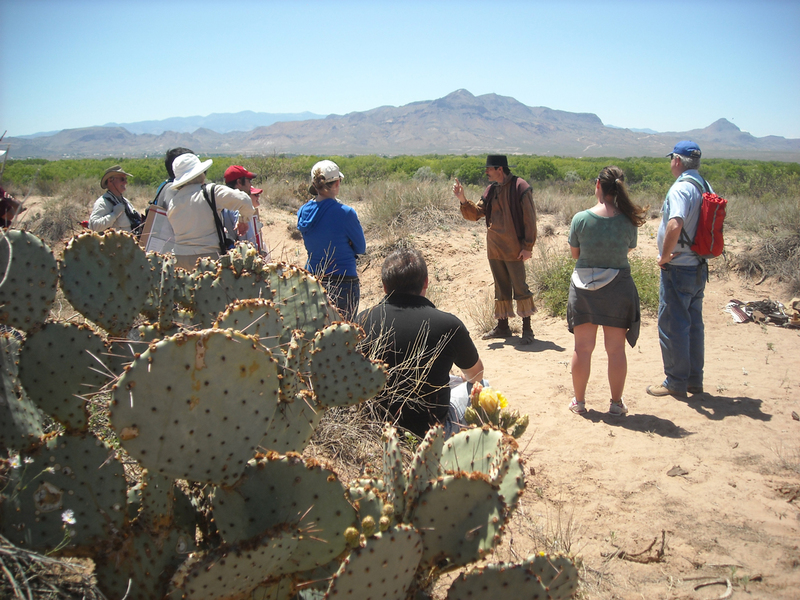 In July 2010, the World Heritage Committee of the United Nations Educational, Scientific, and Cultural Organization (UNESCO) inscribed the El Camino Real de Tierra Adentro as a cultural site on the World Heritage List. Specifically, the inscribed property covers a 1,400-kilometer stretch (approximately 869 miles) of the route from Mexico City to the town of Valle de Allende in northern Mexico and includes five existing urban World Heritage Sites and fifty-five other sites associated with the Royal Road. A decade earlier, in October 2000, the 404-mile stretch (approximately 650 kilometers) of the trail between San Elizario, Texas, and Okhay Owingeh Pueblo north of Santa Fe, New Mexico, was designated as a United States National Historic Trail and managed by the National Park Service and the Bureau of Land Management.